Florence doesn't need much of an introduction as it is one of the most spectacular cities in Italy or maybe even on the world. 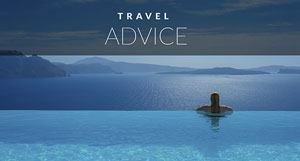 But what are the best things to do in Florence? We've got you covered. In the past it has been a home to many incredible painters, sculptures, architects, poets and important church figures. 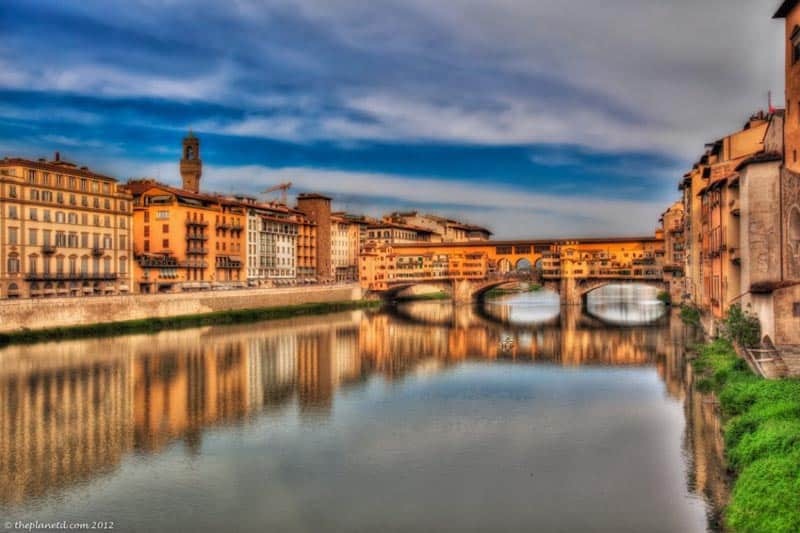 Even if you are not an art connoisseur you probably heard of people such as Michaelangelo, Dante Alighieri, Donatello, Niccolo Machiavelli or Leonardo Da Vinci who made Florence their home at some point and therefore left their work for us to see now. 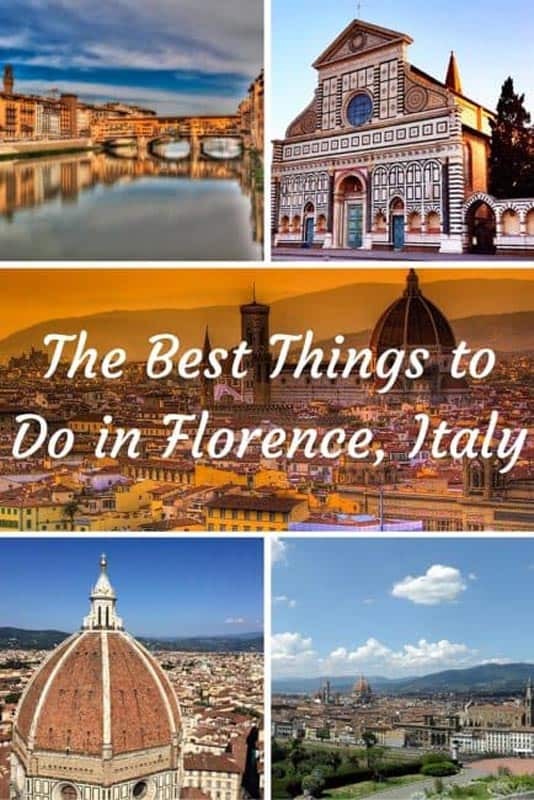 Below you can find a list of top 10 most beautiful things to do in Florence. 1. Cathedral of Santa Maria del Fiore. The cathedral is probably the most famous building in the city. You can spend ages exploring both the outside and the inside of the cathedral as it is full of amazing art. Some say that the renaissance art began here when the famous marble door with the scene of the scarification of Isaac was created. Inside of the cathedral you can see some sculptures by Michaelangelo including the most famous tomb of the Pope Urban the VII. Trust me, you will be amazed by the amount of art you can see! One of the most famous bridges in the world doesn't fail to impress visitors as it looks like from a fairy tale. On the bridge itself you can buy a lot of silver, so if you want to propose to your girlfriend in Florence that is the place to get her a beautiful ring. The bridge has two levels, however the upper floor is closed to public and only opens for special events once or twice a year. 3. Basilica San Miniato al Monte. This church is impressing both from the inside and the outside. It’s situated in the highest point of the city, so the view from the top is really breathtaking. Basilica is one of the best examples of Romansque structure not only in Italy, but also in the whole Europe! 4. Copule of the cathedral of Santa Maria del Fiore. If you are not tired and want to see the city from the high up, you can climb the copule of the cathedral. The view is definitely worth it, but remember there is no elevator inside, so you need to climb all 463 stairs even when it is hot outside! If you don't want to climb too many stairs you can also head to the hill of Piazzale Michaelangelo to have a wonderful view of the whole city. You can either take a short walk up the hill of simply take a bus right to the top of it. Apart from a wonderful view you may see another replica of the statue of David on the top of the hill as well. It is well worth it! 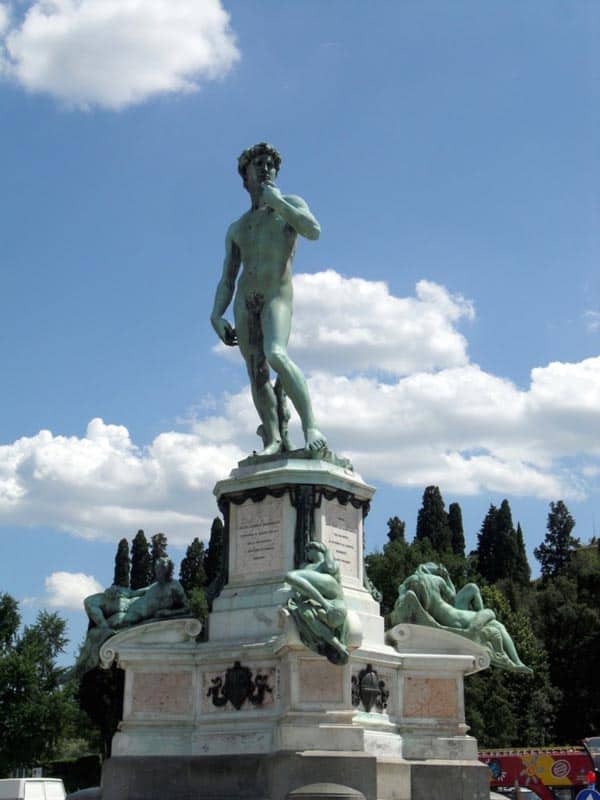 Right after the Piazzale Michaelangelo, Piazzale della Signoria is the most beautiful square in Florence. Go there if you are hungry- it is the best place to eat delicious Italian food like pizza, spaghetti, tiramisu or panna cotta. The statue of David created a lot of confusion as a lot of visitors think you can see it right in the middle of the square. 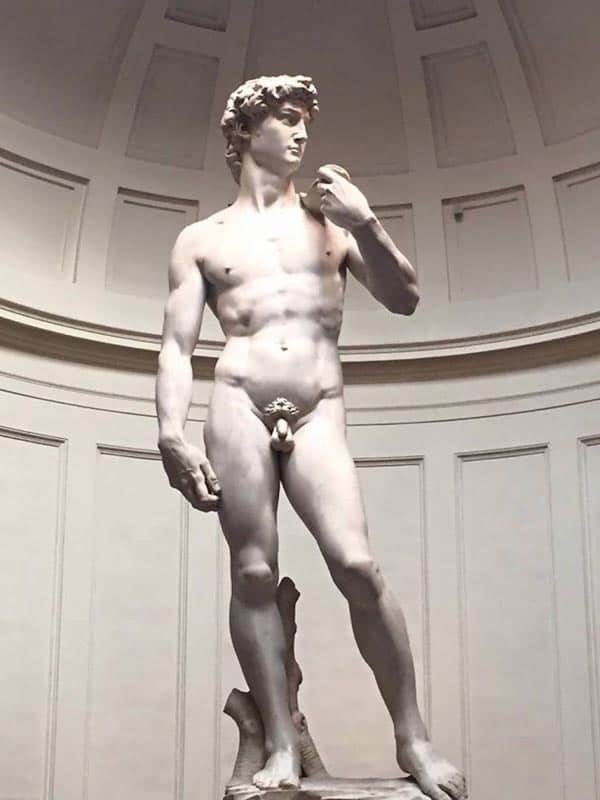 Well, we are sorry to tell you this, but that is just a copy of this famous Michaelangelo's work and the real David is standing inside in the Accademia di Belle Arte Stay patient when you visit as the line might be as long as to Mona Lisa painting in the Louvre or Sistine Chapel in the Vatican city. 8. Basilica di Santa Croce. 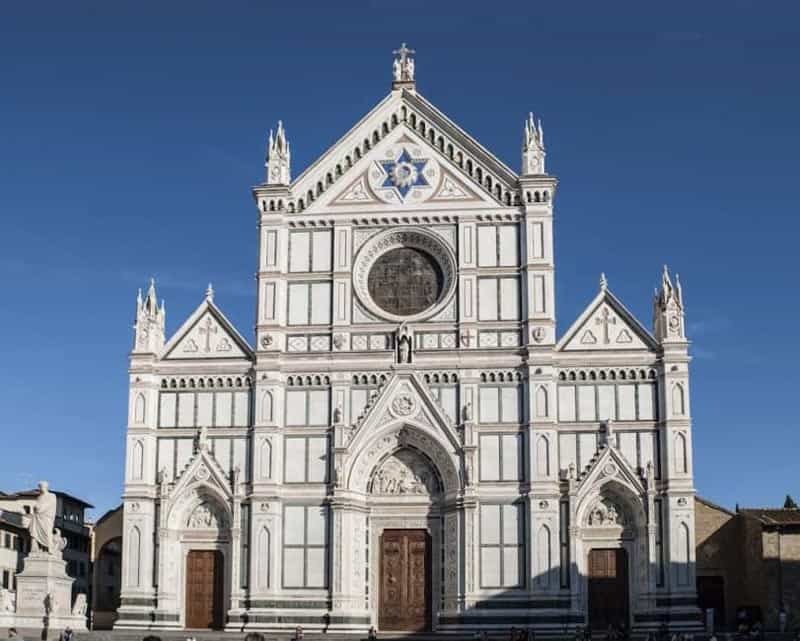 Another beautiful church of Florence! It’s the place where the most famous Italians were buried. 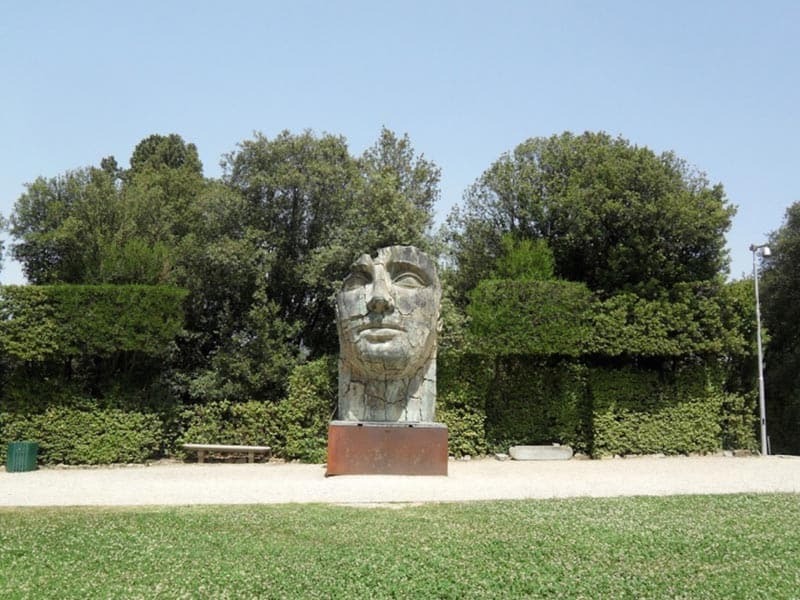 You will find there graves of Galileo, Michaelangelo or Machiavelli. These people changed the history of the world, so it is great to be able to give them proper honour while sightseeing in Florence. 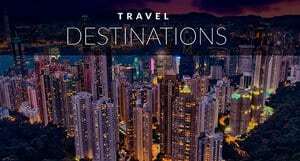 There is so much to see in Italy: 10 Amazing Places to See Near Rome! This wonderful museum probably has so much to see that you can spend hours and hours in there. 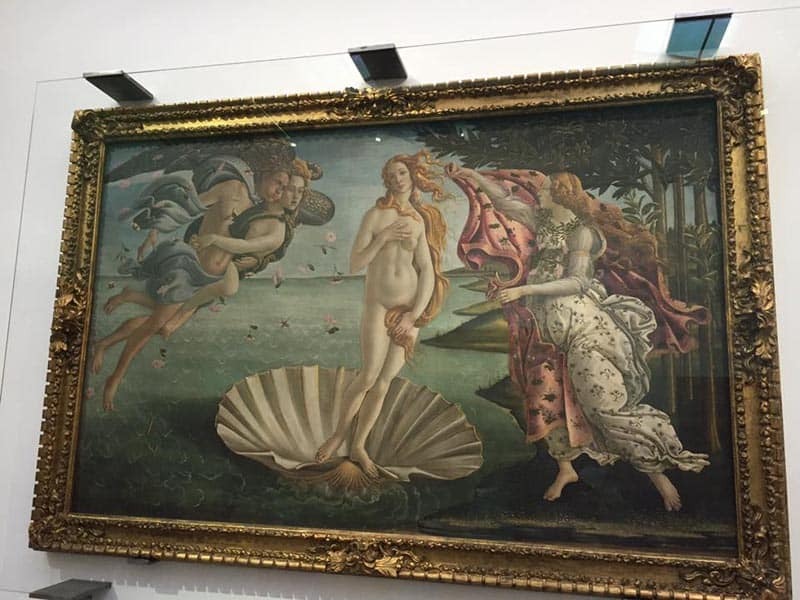 Starting from Venus from Urbino and finishing on Botticelli's Primavera you won't forget your visit. Make sure you prebook your tickets in advance to skip a very long time outside the museum. It is better to get lost in the beautiful streets of Florence than stand in a never-ending queue. Last but not least. Piazza del Duomo, situated in the heart of Florence, is surrounded by beautiful buildings and breathtaking artwork. It has many restaurants and shops around, so it is an amazing place to spend some time after busy day of sightseeing in Florence. Florence is truly a city of art. 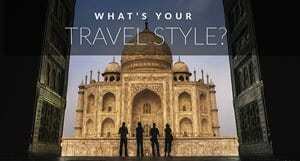 Have you been? 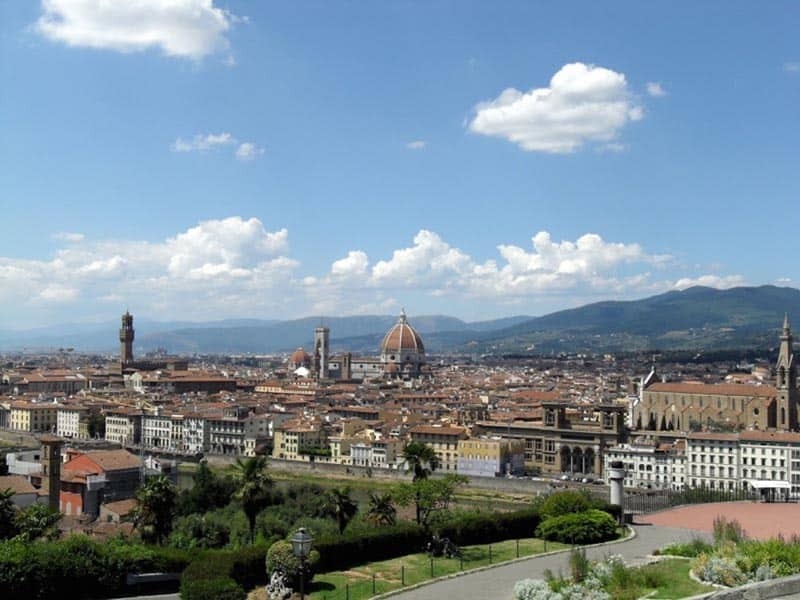 What's your favourite spot in Florence? 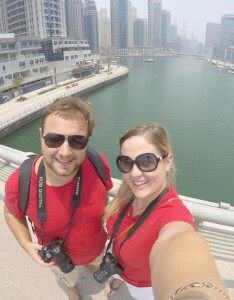 Karolina and Patryk are young, adventurous couple who decided to follow their hearts and start traveling around the world while making money online. 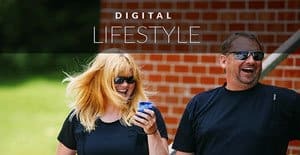 On their blog they are sharing their travel experiences and helping others to start living their dream life. 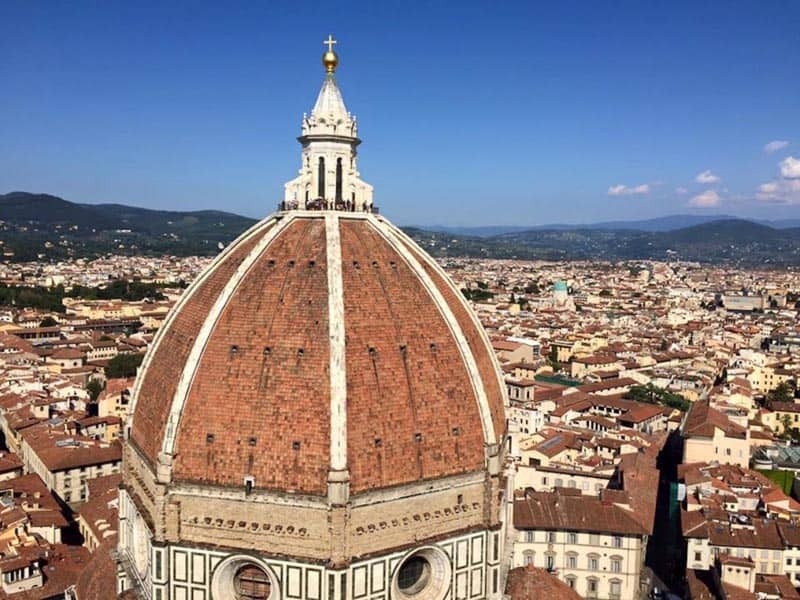 11 Responses to "Top 10 Things to do in Florence"
I had usually needed to head to Florence, however just haven’t had the way yet…all your posts in there are stunning, this precise labyrinth looks so enjoyable, the cave chapel likewise! Nothing better than finding what is sought with such good quality. I’m already with your list that will be my guide for this next month. Thank you. Amazing photos, stunning scenes and beautiful art. 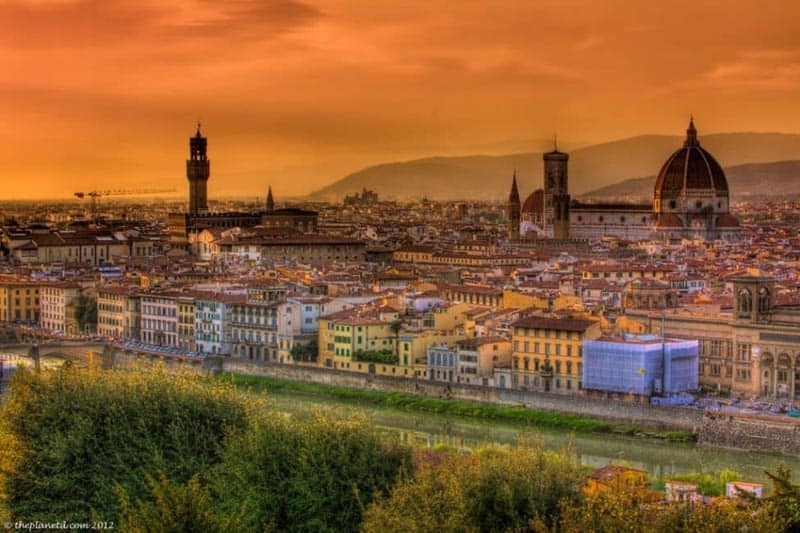 Florance is my dream city. Thank you for the inspiring post. Beautiful , both the local and the photos are breathtaking . Thanks for sharing this with us wonder . I have actually been to Florence and it has to be one off the 1o most amazing and beautiful cities in Europe to visit. I had an incredible time. If I go back I will be sure to use your list as a guide. Very beautiful photos, but the one that you displayed for Basilica San Miniato al Monte is in fact Basilica Santa Maria Novella. The two are extremely similar and easy to be confused, but still different. This is a must visit place. Photos are really awesome and interesting. Thanks for this interesting article. All the photo’s are stunning, can’t imagine in word. The Piazza del Duomo city is look like a paint i still don’t believe that its a city not paint amazing .